Looking for a low-carb and high-protein dinner recipe full of vegetables? 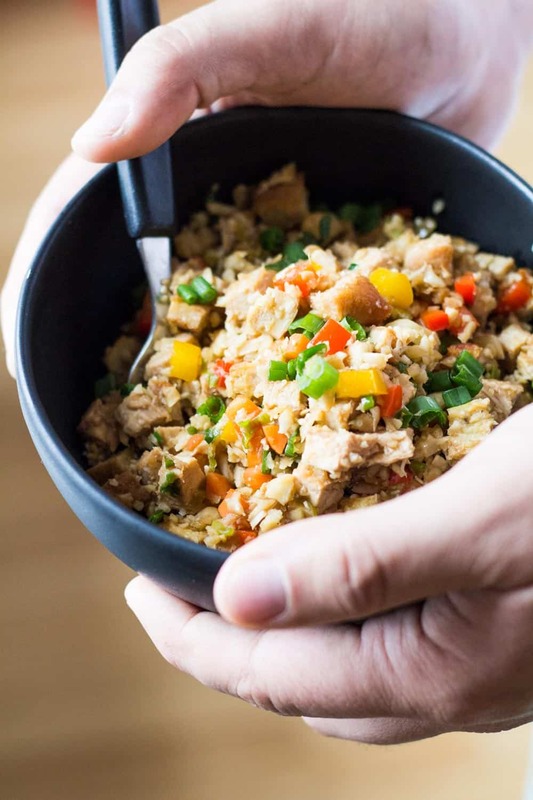 Here is an insanely good 30-minute Asian-Peruvian Cauliflower Fried Rice with egg and chicken. The recipe was inspired by the typically Peruvian dish “Arroz Chaufa”. A fusion between Peruvian and Chinese cuisine I should say. Peru has one of the largest Asian populations in Latin America, primarily Chinese and Japanese, and thus Peruvian cuisine is heavily Asian influenced. The original obviously contains “arroz” (rice) but I figured why not fusion with a third culture? 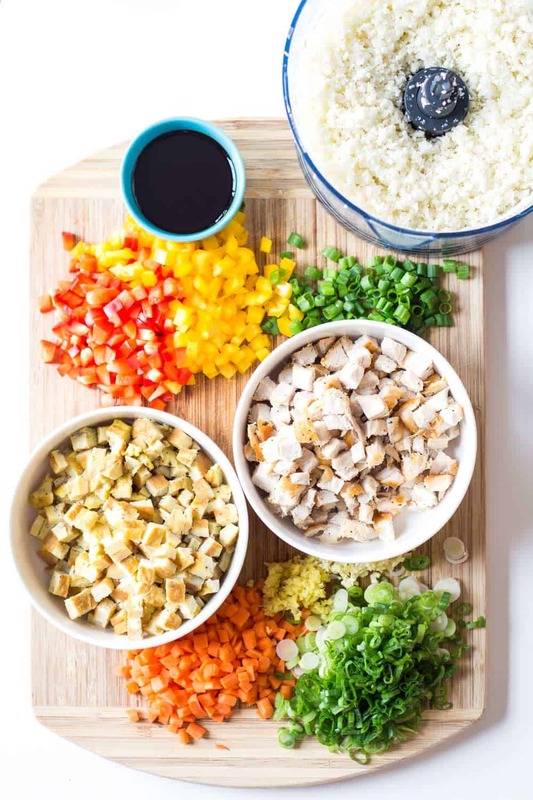 The low-carb food culture, the cauliflower rice movement, the “modern western cuisine” :D Oh my…..let’s just say, that was an extraordinary idea of mine! Now let’s get to the details of the recipe. First and best: no rice cooking required. Grate the cauliflower or process it in a food processor (in batches!) until rice-sized and that’s it. 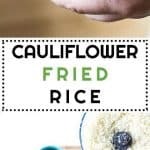 It takes about 5 minutes, if at all, to “rice” cauliflower. Chop loads of colorful vegetables so it ends up looking fun. Add cooked egg and cooked chicken. Cooked ground beef is a good alternative. Fry everything depending on the ingredient’s consistency. The hard stuff first, the soft stuff/cooked stuff last. Add at least soy sauce, garlic and ginger. Better yet, all the before PLUS ají for the best flavor in the world. I know it’s hard for many of you to get your hands on Ají Amarillo but I really, really, really think it’s worth the effort searching for it. Find a Latin American Store within driving distance and buy it. It lasts forever in the fridge and I promise you, once you’ve tried it you will want to add it to pretty much all of your dishes. Ají is unlike any other chilli you’ve tried in your life. It has a distinct flavour that cannot be compared to anything and it is THE ingredient that makes Peruvian cuisine Peruvian. If you only have a Latin American Store very far from where you live, go there only once a year and buy many jars. Fill ice cube trays with it, freeze the paste into cubes, then remove and put in a ziploc bag and freeze for up to a year. Whenever you need some you just take out an ice cube sized piece and you’re good to go. If you are a fan of cauliflower and chicken you should totally go check out this Thai Chicken Cauliflower Curry (for which I have a video, too) and this One Pan Curried Chicken Cauliflower. 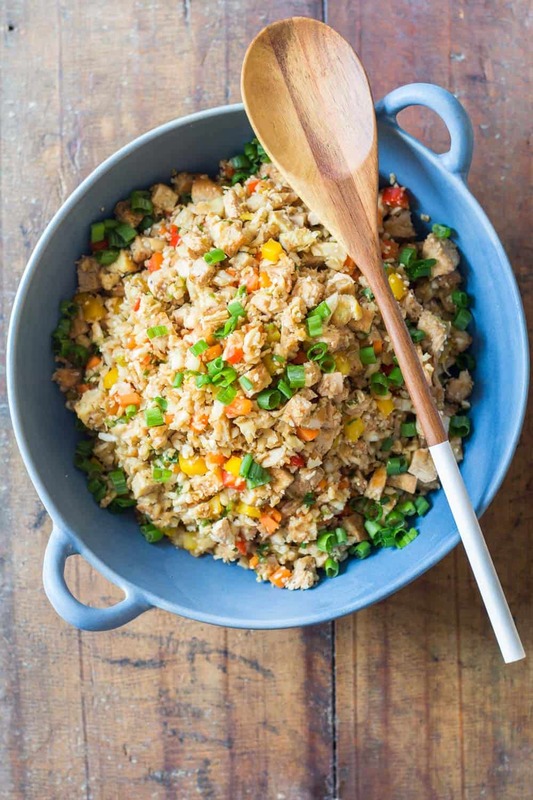 This Cauliflower Fried Rice is a low-carb and high-protein dinner recipe full of vegetables and Asian-Peruvian flavor. 30 minutes from start to digging in. Heat a large heavy-bottom pan that has a lid over medium heat. Heat a regular sized pan over medium heat. Salt and pepper chicken breast on both sides. In a small bowl, whisk together 4 eggs with a little salt and pepper. Once large pan is very HOT (!) add a splash of oil and then chicken breast. Fry for one minute, then turn, fry for another minute, cover with lid and immediately reduce heat to LOW, set an alarm for 10 minutes (important!). Add a splash of oil to the HOT small pan and then add whisked eggs and let cook like a pancake. About 2.5 minutes on one side and another minute on the other. Remove from pan when cooked through and cut into small squares. Now cut cauliflower into florets, wash, shake out well and add to a food processor (I had to do this in 3 parts because my food processor is small). Pulse until you have rice corn sized bits. Set aside. When chicken breast alarm goes off, remove pan from heat but do NOT lift the lid. No peeking! Just remove from heat and set a new timer for another 10 minutes. Peel carrots and chop into corn kernel sized pieces. Wash and thinly slice white part of spring onions and place next to carrots. Then slice green part a little thicker and place on separate corner of chopping board or in a small bowl. Peel and grate garlic and ginger and place next to chopped carrots. Wash bell peppers and chop into corn kernel sized pieces and place on separate end of chopping board or a small bowl. Once chicken breast alarm goes off again, remove chicken breast from pan and place on a chopping board. Cut chicken into chickpea sized squares. Place the large pan you used for the chicken breast back on the burner and heat over medium heat. Once hot, add a splash of oil and add chopped carrots, white part of onions, garlic, ginger and ají amarillo to the pan and stir-fry for about 2 minutes, then add cauliflower rice and chopped bell pepper and stir-fry for another 3 minutes, then add chicken, egg and soy sauce and stir fry for another 2 minutes. Very tasty, I make some every week. HaHa gotta love auto correct …chaufa not chauffeur rice! GREAT recipe! 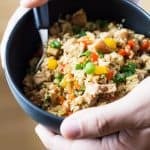 I’m new to keto and went web surfing for keto chauffeur rice, (so many of my favorite flavors) and was looking for how to create it with caulirice and you nailed it! I only added more ginger (my personal taste) and a little cilantro at the end with the onion tops. Thanks Lorena! Just made this, cheated with Riced Cali from Aldi. Can you provide the macros ?! Please. It was so darn yummy. I made this tonight for dinner and my fried rice loving kiddo couldn’t tell the difference! This will be a staple. Just added the info :D I’m so happy you liked it that much. 1/4 of the whole recipe. Made this tonight and it turned out great! I used leftover cooked chicken breast and added a few drops of sesame oil and about 1\4 cup of frozen baby peas at the end, but otherwise stuck to the recipe. Delicious! I am loving cauliflower rice these days. I cheat and get it at Trader Joe’s. This looks super yummy!